Tomorrow my wife and kids are leaving for a summer vacation trip, so today was spent preparing and packing. 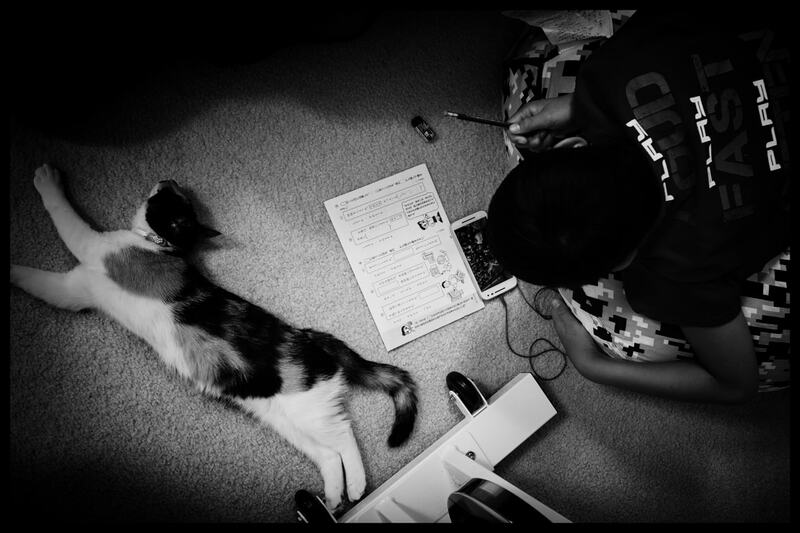 In the photo above, you can see our son Koa working on his Japanese homework, and our kitten Yuzu is keeping him company, as cats do.  I took the photo using standard Fujfilm Provia film simulation, then I edited the JPEG in Nik Silver Efex Pro 2, which is a great way to convert to black and white and find just the right look. Starting tomorrow I will be a summer bachelor for a while but I still have two cats and a dog to keep me company so I shouldn’t be too lonely. I’ll also have some tasks to do around the house and I predict that I will be spending a lot of time at work too, trying to get ahead on projects while I have the chance to put in a few extra hours.